All Americans know the beloved Uncle Sam, the star-spangled hero who urges Americans to do their part. To serve. To vote. 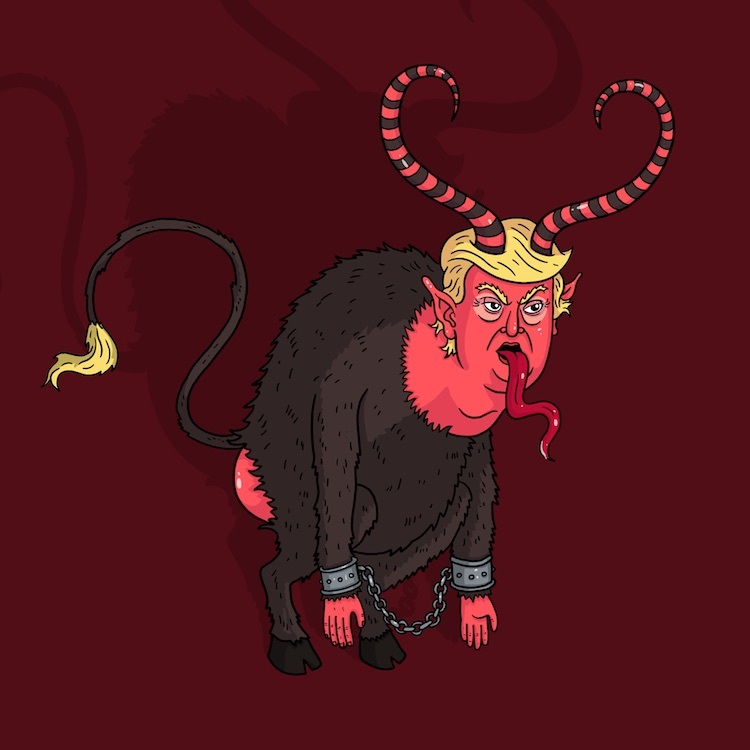 Trumpus is a scowling beast with a glowing, orange face and small hands. His goat-like legs and hooves are hidden by red pants and polished shoes. A golden pelt carved from a sacrificed sloth covers his curved horns. Uncle Sam years ago decided to employ the ogre when be become dismayed with apathetic and jaded voters. Many were forgetting to vote at all, and many more were failing to inform themselves. And so many were angry. “In exchange, you will no longer have to pay taxes,” Uncle Sam promised. Trumpus smiled. Bits of red, gooey matter hung from his teeth. Maybe human flesh? Or rotting gums? It was just this disgusting goo speckled with brown flakes of feces. Was it feces? Really? Blood and feces in his mouth? Uncle Sam wasn’t sure, but he was on the verge of vomiting as he shook Trumpus’ tiny hand. Anyway, Uncle Sam departed, confident Trumpus was the perfect force to frighten Americans into action. At first, it worked to a degree. Trumpus ran for the presidency. He made voters uncomfortable. He made them laugh. And he stood in contrast to those who would win the nominations. He spoke of a ruined nation. He offered ridiculous solutions. He spoke crudely and outrageously. But as Uncle Sam looked forward, he failed to notice. Trumpus was not frightening voters toward information. He was winning their support. And then one year, he won the nomination. Uncle Sam stared at his horrific creation. “What have I done?” he asked no one. Trumpus grinned. Just this maroon slobber dripping from his scabbed lips. Just disgusting. Tears streamed from Ben’s eyes. “But what can we do?” he pleaded quietly. “What will happen? Steph thought a moment longer. And she said nothing.